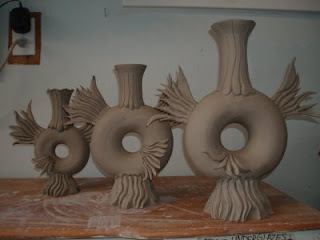 Right now I am working on a series of aqua vases for an upcoming show at the Arts Center in Corvallis, OR. 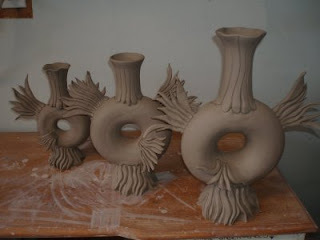 I plan on incorporating the vases into an installation coupled with an oceanic painting I made for my mom of the ocean. Greenware assembled and waiting to be carved. 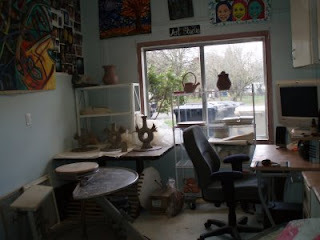 After renovating our new house, my husband and I have created a space in the remodeled garage for my studio. It is unfinished and I will be replacing the window and re-doing the wall that the window is on, adding insulation and painting but this is it for now. I am excited to start making new work for my portfolio as well as work for exhibitions and craft shows this summer! Hey. Thanks for letting me in on the fact that you have a blog. Everything looks great. I hope the new space works out.